I would like everyone to please welcome the newest addition to the kitchen "Noble Ms. Brown"! She is a street orphan picked up from Noble Street and taken into custody with much enthusiasm, for a Le Creuset dutch oven is a rare gem of a find. I have been dreaming about braising since last winter, and with this new recruit, she had to be put to the test! Her opponents are beef short rib bones, Negra Modelo beer, butter, garlic, onion, cabbage, lemongrass, red pepper flakes, thyme, cloves, coriander seeds. Melt a liberal dose of butter and brown the bones first. Then the garlic and lemongrass had to join the butter action. Red pepper flakes to start oozing out their kick and the onions jump in. 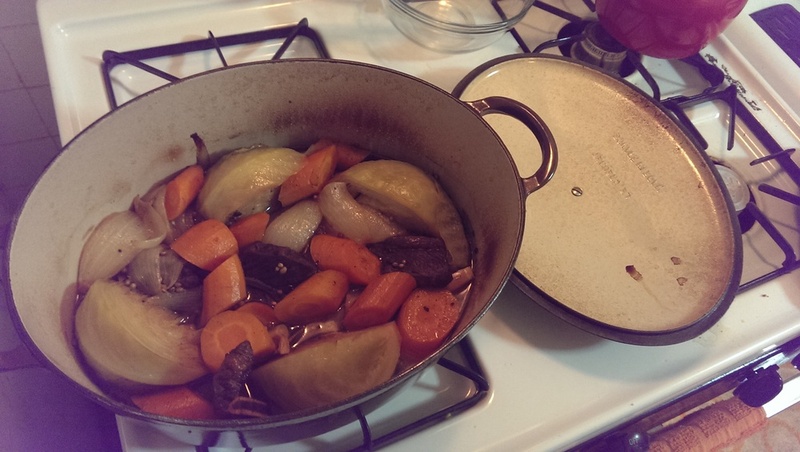 With the telltale signs of a successful braising in the speckled browning on the edges. Well done Noble Ms. Brown, you have now been initiated into my kitchen team. As Fall descends upon us, now she will be participating in many, many delightful heartwarming meals to come! What does vivaciousness look like?